Paper 14" x 8 1/2"
Side 1 printed with 2 PMS colors using light coverage. 12pt C1S White Semi-Gloss stock coated with Aqueous Gloss. 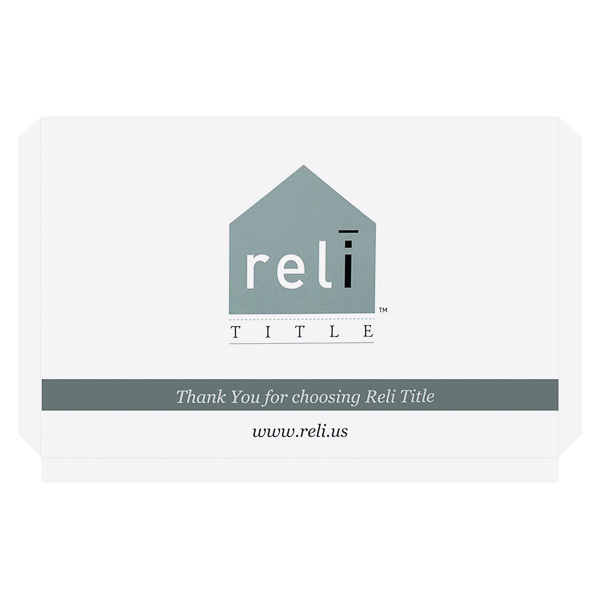 A house-shaped logo gives a nod to Reli Title's role as a real estate title and settlement service provider. Light gray accents have a green tint to soften the design. A thank you note on the front panel reinforces the brand's friendliness. The pocket helps buyers or sellers reach the company, as it is printed with contact information for each location and the corporate headquarters. Four-color process printed on Side 1 of 14pt C1S White Semi-Gloss stock. Coated with BioPlus UV. Two sets of H1 business card slits under flap. 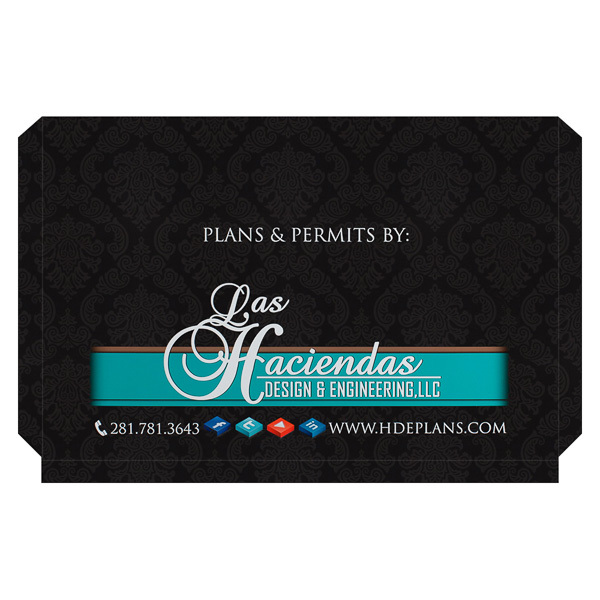 Las Haciendas presents engineering plans and permits in this stylish design. Black outer panels are printed with a subtle paisley pattern to create texture. Turquoise, white, and gold accents pop against the darker color and add a slightly western feel. A photo of skyscrapers on the flap implies innovation and construction; employees can also write in project names and addresses here. Contact information along the bottom of the front cover uses a slender typeface to balance the logo's swirling script. 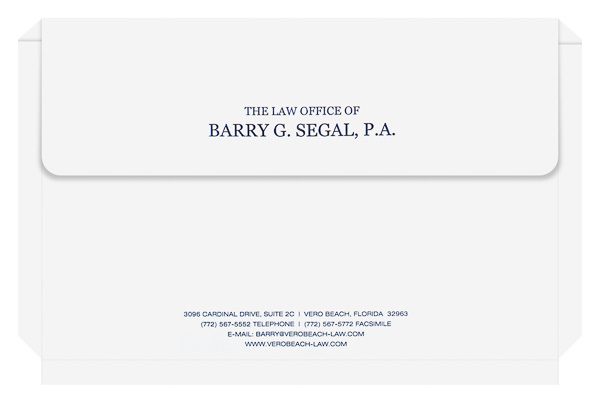 The Law Office of Barry G. Segal, P.A. 2 foil stamped areas and 1 embossed area on Side 1 of uncoated 100lb White Linen stock. Crisp white panels give the Law Office of Barry G. Segal a professional look that hints at perfection. Serif type printed in navy blue alludes to tradition and respectability. These design choices combine to give the brand a prestigious look worthy of a law firm. Contact information along the bottom helps clients reach an attorney easily. An expandable, extra-large pocket holds legal documents sized up to 14" x 8 1/2". Its unsealed gusset accommodates a packet up to 1 1/2" thick. To guarantee that papers stay tucked inside the pocket, select Velcro® or elastic fasteners to latch the fold-down flap. The product’s landscape orientation offers ample room on the exterior for custom designs—including wide photographs, illustrations, or an artistic logo. Dimension Closed: 15" x 10"
Dimension Open: 15" x 14 5/8"
Acceptable Insert Sizes: 14" x 8 1/2"